Strap or Screw-On Fit, Adjustable Height and Ambidextrous. Positions your aiming eye higher for alignment with scope sights. Molded hard rubber cheek rest with two risers, 5/8" and 1" in height. Finished in flexible walnut, camo, or black to match most stock finishes closely. Attaches with 2 screws or velcro strap. walnut or Camo options include a vinyl veneer that is easily attached to the base to match your rifle stocks color and finish. bought for mt daughters rifle ,works great!!! 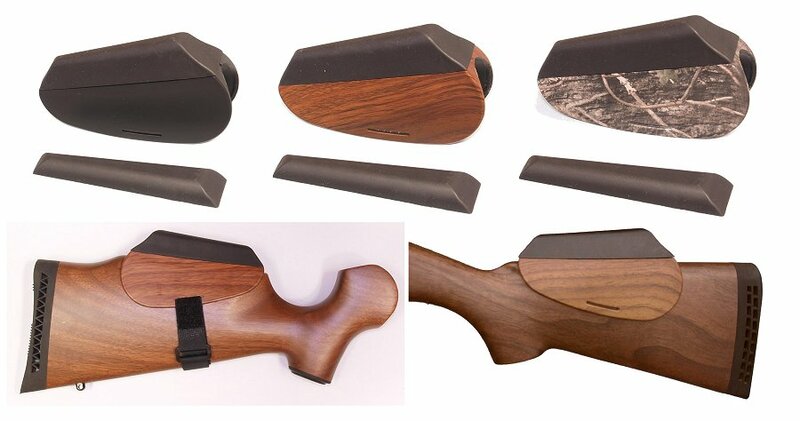 Purchased two Accu-Riser Cheek Rests for my boys' Savage Mark II .22LR rifles. I mounted the cheek rests with the screws that were provided and both of my sons, ages 10 and 12, commented that the cheek rests made it much easier to align their eyes with the scope. This is a good, economic solution if you need a decent cheek rest. Accurate description, prompt delivery, well packaged. Thank you. I used this product to raise the cheek riser height of my Ruger 10/22 with the plastic stock. I didn't want to permanently mar my stock so I attached this riser using flexible sticks-to-itself bandage tape. The height was still not enough so I added more height by building up layers of rubber pad on top of this riser. My only ding against this product is that I wish that it had come with more height adjustability. Really like this product. I fitted it to my walnut stocked 10/22 to get proper cheek weld with my scope. Works like a charm. A word of warning if installing on a hardwood stock. The recommended pilot hole size is way to small. That being said, if you are having difficulty getting proper eye alignment on your scope this is the product for you. Highly recommended. Excellent product. Needed higher set scope rings for my Encore. Product worked great. Has improved my shooting accuracy.